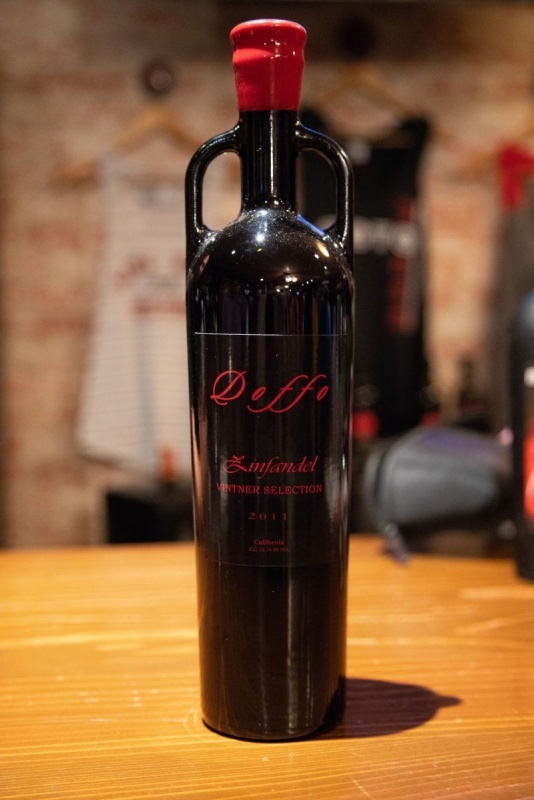 Doffo Wines is the third winery that we visited during our recent tour of Temecula Wine Country. We visited with luxury travel blogger Pam Rossi of Always5star.com. Doffo’s tasting room stood in stark contrast to the simple, functional facility at Palumbo from which we had just come. It was larger and busier; food was on offer in a covered area outside the tasting room. There were also several historic motorcycles clustered around a large building. The tasting room itself was lively, with more motorcycles hung on the wall along with related posters. Viognier is currently the only white wine Doffo produces. We had been instructed to ask for Damian Doffo; whilst we waited for him, we started our tasting with the 2017 Viognier ($32). The wine had been fermented in concrete, with no interaction with oak. It had a very pale colour; with a powerful floral nose of jasmine, honeysuckle, and peach. The flavour profile matched the aromas; with upfront floral notes backed with honey and apple. Medium acidity gave this wine a pleasant freshness. 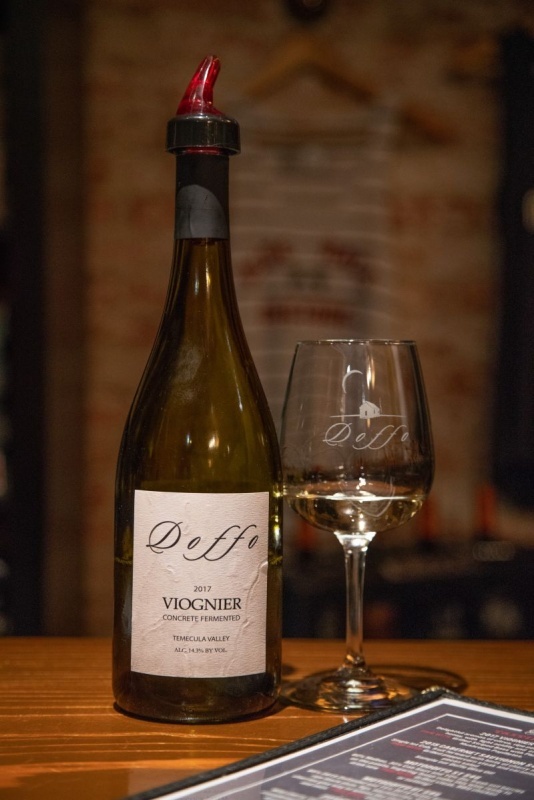 Doffo is a winery that focuses on red wine; this is the only second vintage of their Viognier. Damian Doffo pouring us some of their premium wine. Damian joined us and started to tell us the story of the winery and the motorcycles. In the early part of the last century, his family emigrated from Italy to Argentina His father, Marcelo, grew up on the family soybean farm. Marcelo immigrated to the United States in the 1970s. Marcelo and his brother started an auto body shop in 1980. In the late nineties, he purchased a cattle ranch in Temecula and converted it to a vineyard. 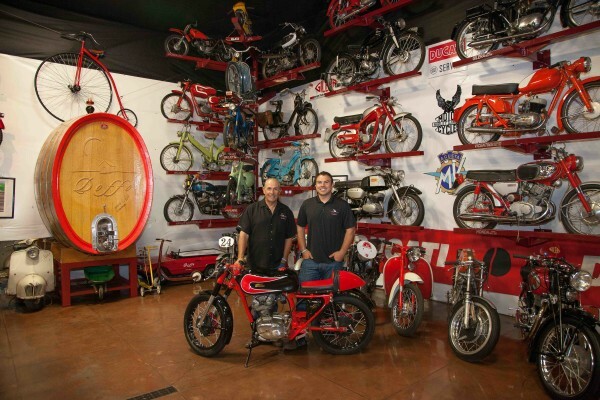 The two Doffo businesses overlapped with Marcelo’s passion for restoring old motorcycles and with room in his garage running out, he started putting some of them in the winery’s tasting room. Damian explained that they ride and race motorcycles as a family. One of the posters on the wall was a Gileria advertisement from 1949 with a blindfolded woman; beside it is a photograph of the same motorbike with Damien and his then-fiancée reproducing the picture. Amber comments: The thing that most impressed me about meeting Damian and speaking with him was his old-fashioned work ethic and strive to make money, however he can for his business. For example, Motorcyclists don’t necessarily drink wine, so he offers a cappuccino cart and snacks for those who want to come to enjoy the atmosphere and don’t want to drink and drive. He seems to have a drive that I don’t see in people of his age these days that harks back to immigrant mentality. We all walked away completely impressed wishing we could clone that spirit in some of our young ones. Our next wine was the 2014 Syrah ($49), which was 30% aged in heavy toasted American oak casks. The nose was of cherry, espresso, and plasticine. The wine was of medium body with well-balanced acidity, a smooth flavour of cherry and pepper, all leading to a long finish with notes of wood. Interesting bottle and hand dipped wax closure on the 2011 Zinfandel. Neither Marcelo nor his son studied winemaking. Damian said that they are farmers first and are “gut winemakers”. The five acres that his father first purchased had been intended as a retirement property. 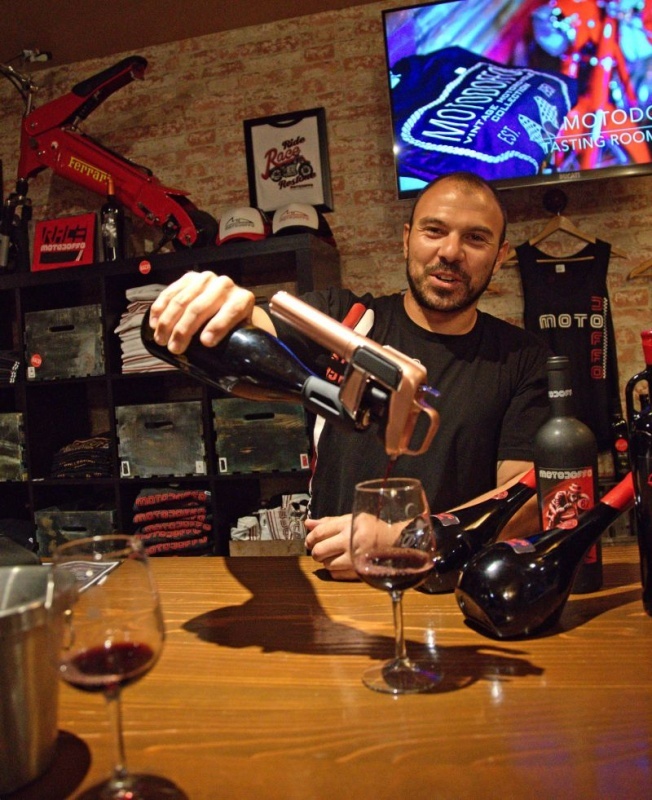 Marcelo started making wine for friends and family before it grew into a full family business. Brigitte and Samantha, Marcelo’s daughters, are also key parts of the business. Samantha is the Events Coordinator; Brigitte is the Tasting Room Director, which includes responsibility for the aesthetics and the design of much of the apparel. The tasting room is full of shirts and jackets. The wide range of clothing enables Doffo to sell to the “guy on the motorcycle”, as they are not going to be tasting and buying wine, but are attracted to the location for the vintage bikes. MottoDoffo is their younger hip line of wines. The third wine was the Mottodoffo ST ($46), a blend of Malbec (60%), Cabernet Sauvignon (30%), and Zinfandel (10%). The label, by the artist Robert Carter, evokes vintage motorcycle racing. The wine’s medium intensity nose was laden with cherry aromas. A soft mouthfeel with a complex and balanced set of flavours: cherry, blackberry, blueberry, and cloves. This is an eminently drinkable wine. 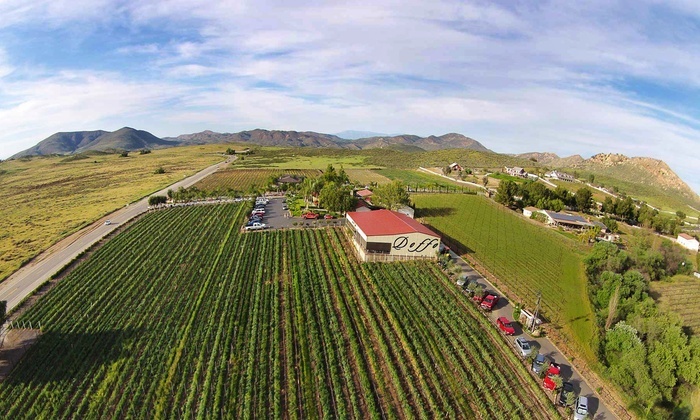 Aerial photo of Doffo Winery courtesy Doffo Winery. Damian told us about an experience that Doffo offers to their wine club members. The experience starts with participants harvesting grapes and then participating in the crush. Damian provides videos of fermentation through the wine being put into barrels. Participants return in February to barrel taste and again in October to bottle their wine. They each get a case of the wine that they have made. Amber comments: If we lived closer we would have taken up this deal. How fabulous to learn the entire process and make your own wine. Apparently, they send you crop updates, photos and all kinds of information in between sessions. I would have loved to take part. The last wine we tried was the Syrah reserve ($150). This wine spends forty-eight months in oak. The nose was intense, with cassis and cloves. The wine exhibited good structure, with an excellent balance of acidity, blackcurrant and plum, and a backing of pepper. This was, without doubt, the best of the wines we tasted at Doffo. Damian was rightly proud of this wine; he also showed us the special bottle that he uses for this wine. 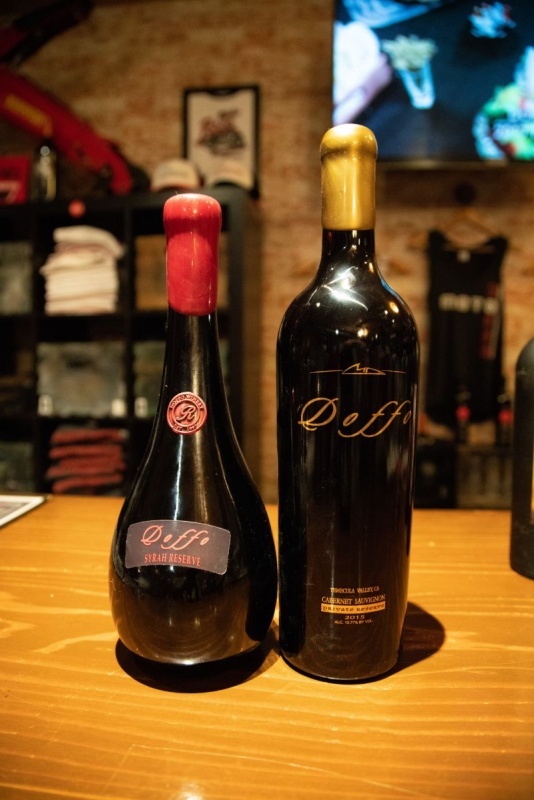 It is imported from Italy and Doffo are the only winery in the US to use this shape of the bottle. I admit that Amber and I had the same thought; however cool the shape, it would not fit into wine racks. Amber comments: Damian is a really clever guy and it comes through in conversation. He’s looking to do things with quality and style. I liked that about him. However, when it comes to wine, sometimes reinventing the wheel isn’t so good. When I think about serious wine drinkers who have cellars or even wine coolers having traditionally shaped bottles is a must so that they fit for proper storage. I think many of us would skip over an oddly shaped bottle rather than embrace it for its “cool factor”. I’d also rather the wine price be reasonable rather than pay for extra special packaging. Damian showed us the main collection of motorcycles which sit in a large facility beside the main tasting room. The room also has a small bar for member tastings and a screen that can be used for showing films or motorcycle races. 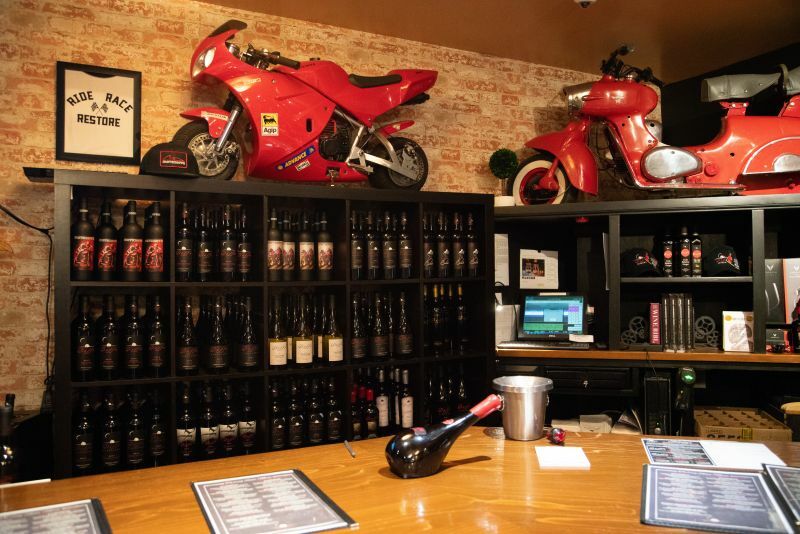 For more articles on our visit to Temecula, visit our posts about Palumbo Family Vineyards and Winery and Baily Vineyard and Winery. 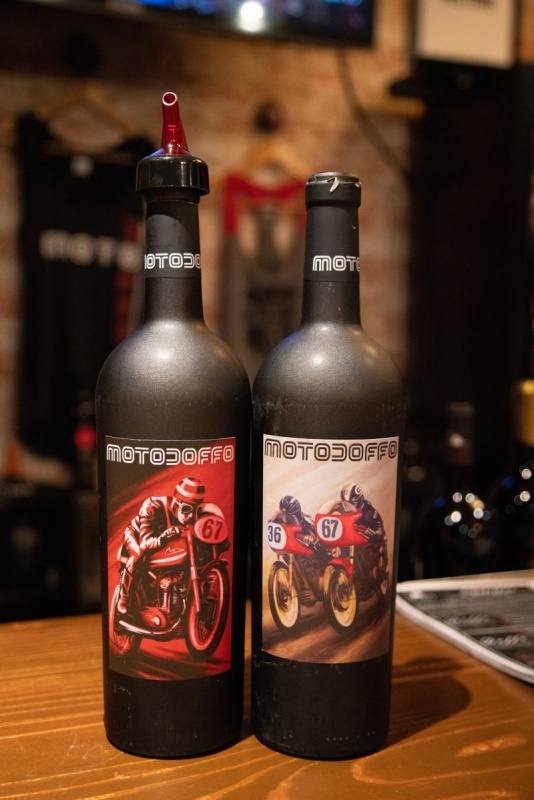 Doffo is a winery filled with character that reflects the family’s passion for motorcycles and wine.